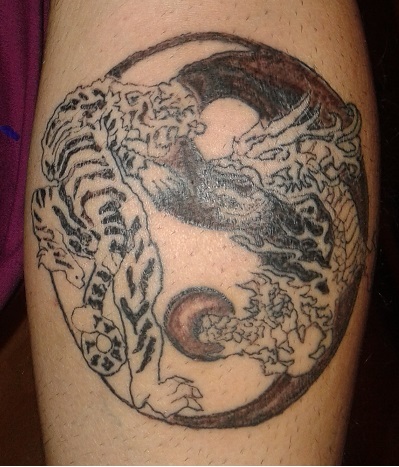 The tattoo is a representation of a tiger and a dragon on a tao. They represent the duality that can be attributed to the opposite like white and black, in the case of colors. The dragon represents according to biblical theories a bad sign or disaster, while according to the Tibetan and Asian or Buddhist religions, is a sign of renewal and protection, and is a symbol of strength. The tiger is the skill, strength and not a Simolo mainly linked to the mythology as the dragon, but it is a predator belonging to the earthly reality. So the design is the link between the imaginary (the dragon) and the real (the tiger).